I've quite liked the look of some of the gear upgrades that my cleric got from Ravenloft, so I didn't bother to transmute them into something else and just switched to a different look for a change. What I didn't consider was that simply wearing the newest shinies would make me look identical to other people doing the same... so I was quite startled when I ran into a fellow cleric in the Barovian inn that was wearing pretty much the same outfit as me (not to mention that she looked like she was giving me the evil eye). It's funny to think that everyone wearing whatever was the newest endgame set used to be the norm, but with the heavy focus on customising your appearance to look more unique in recent years, it actually feels strange now when you run into someone else wearing the same outfit. Boy, that takes me back to the days of Tier 9 and 10 gear in Wrath, when I last kept up with "current" gear. 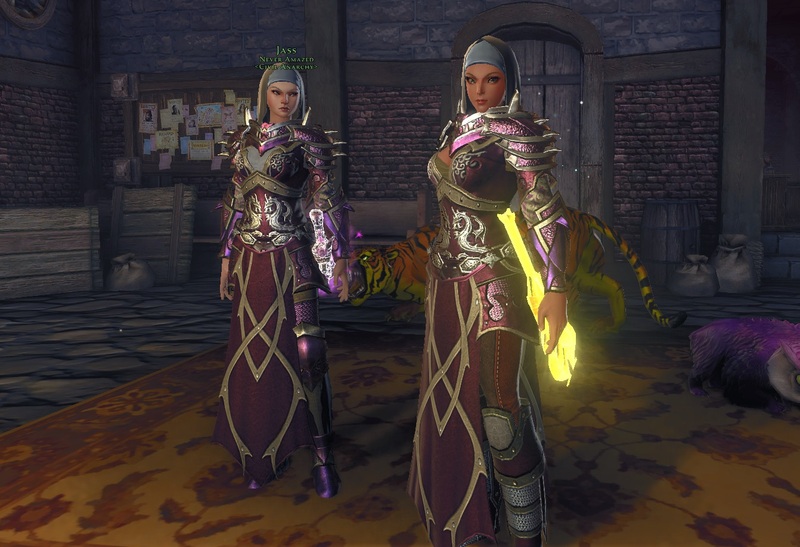 Neverwinter's armour is mostly pretty sensible, which I like. :) The occasional bit of cleavage here or there is fortunately as bad as it gets.